1. Ahenny. North Cross. North Side. Detail of Base. There are two sandstone crosses in this churchyard. 2.46m high 1.37 across arms. Shaft tapers 49 cm wide and 36cm thick at end. It rests on a stepped base. It is topped by a stone which is the subject of debate. There are queries as to whether this unusually shaped stone belongs to the cross at all. Porter (1931, p.22) has suggested a bishop's mitre. Richardson has suggested an association with the Church of the Holy Sepulchre in Jerusalem, (Richardson, 1984, p.130). This base panel is subject to queries. 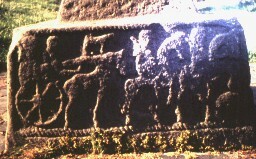 A horse drawn chariot is recognisable, preceded by 2 horsed figures, one of whom is carrying a spear. There are 2 figures in the chariot, the larger of the two is hooded, the smaller figure ( charioteer?) carries a whip. Harbison, Peter, The High Crosses of Ireland: an iconographical and photographic survey 1st, Habelt, Bonn (1992) High Crosses of Ireland. Archaeology, iconography, comparisons, images..
Allen, J.R., , ‘On some points of resemblance between the art of the early sculptured stones of Scotland and of Ireland’. In Proceedings of the Society of Antiquaries of Scotland (1896/97) 309-332. Brandt-Forster, B., Das Irische Hochkreuz. Ursprung - Entwicklung - Gestalt 1st, , Stuttgart (1978) . Crawford, H.S., , ‘The Crosses of Kilkieran and Ahenny’. In Journal of the Royal Society of Antiquaries of Ireland (1909) 39, 256-260. Crawford, H.S., Handbook of Carved Ornament from Irish Monuments of the Christian Period 1st, , Dublin (1926) v.
Edwards, Nancy, , ‘Some Observations on the Layout and Construction of Abstract Ornament in Early Christian Irish Sculpture’. In Studies in Medieval Sculpture. Society of Antiquaries of London, Occasional Paper, new ser. (1983) 3, 3-17. Finlay, I., Columba 1st, , London (1979) . Graham-Campbell, J., , ‘Irish Monastic Art, fifth to eighth centuries’. In Monastic Studies (1983) 14, 225-245. Harrison, J., , ‘The Return of the Magnificent Seven. Some Evidence for Folktale depictions on High Crosses’. In Sinsear, The Folklore Journal (1980) 2, 128-135. Roth, H., Propylaen Kunstgeschichtem Supplementband IV 1st, , Berlin (1979) . Henry, F., , ‘L'Inscription de Bealin’. In Revue Archéologique, 5th ser. (1930) 32, 110-115. Henry, F., Early Christian Irish Art 1st, , Dublin (1954) . Henry, F., , ‘The Celtic Crosses of Slievenamon’. In Romantic Slievenamon, in history, folklore and song (1955) 88-90. Maher, J., Romantic Slievenamon, in history, folklore and song 1st, , Mullinahone (1955) . Ní Chatháin, P. Richter, M., Irland und Europa. Die Kirche im Frühmittelalter - Ireland and Europe. The Early Church 1st, , Stuttgart (1984) . Hickey, E., , ‘North Cross at Ahenny: A suggested Interpretation’. In Journal of the Royal Society of Antiquaries of Ireland (1955) 85, 118-121. Ó Murchadha, D., , ‘Stone Sculpture in Pre-Norman Ireland’. In The Capuchin Annual (1969) 172-200. Ó Ríordáin, S.P., , ‘The Genesis of the Celtic Cross’. In Féilscribhinn Torna (1947) 108-114. Pender, S., Féilscribinn Torna 1st, , Cork (1947) . Power, P., , ‘The Celtic Crosses of Kilkieran, Kilkuspeen and Killamery’. In Journal of the Waterford and South-East of Ireland Archaelogical Society (1906) 9, Supplement, 1-20. Roe, H.M., The High Crosses of Western Ossory 2, Kilkenny Archaeological Society, Kilkenny (1969) . Smyth, A.P., Scandinavian York and Dublin. The History and Archaeology of two related Viking Kingdoms II 1st, , New Jersey/ Dublin (1979) . Stevenson, R.B.K., , ‘The Chronology and Relationships of some Irish and Scottish Crosses’. In Journal of the Royal Society of Antiquaries of Ireland (1956) 86, 84-96. Stevenson, R.B.K., , ‘Aspects of Ambiguity in Crosses and Interlace’. In Ulster Journal of Archaeology (1981/82) 44-45, 1-27. Stokes, M., , ‘Notes on the High Crosses of Moone, Drumcliff, Termonfechin and Killamery’. In Transactions of Royal Irish Academy (1901) 31, 541-578. Ullrich, H., , ‘Irische Hochkreuz als zeugen nordischer frommigkeit’. In Kunst und Kirche (1939) 16, 112-116. Visser, G., Voskuilen, A., Zandstra, W., Die Ierse kruisigingsokonografie van de 7de tot de 13de eeuw. I Tekst; II Catalogus 1st, , Utrecht (1981) .